A thing of beauty isn’t it! I received one of these to review from this selection at Hotel Chocolat. If it is beyond your budget, their Easter range starts from just £5 and you can sort the products by ‘lowest price’. I have been looking at other ‘luxury’ eggs in the supermarket and although I can see cheaper ones and ones with BIG packaging, I can’t actually find one that surpasses the quality of the Hotel Chocolat eggs. 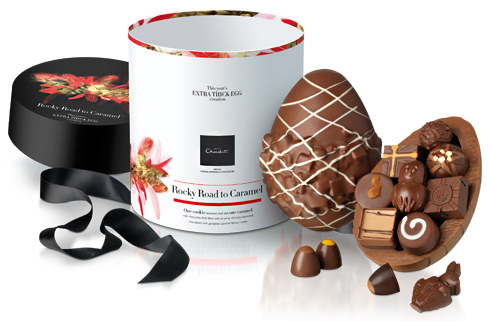 The Packaging screams quality at you and as for the egg itself – it’s a chocaholic’s dream! I also couldn’t help but note that their head office is practically round the corner (ish) from my house…..
Looks almost too good to eat…. Ok. I’ll just lick it. Less calories and it would last for longer!